Two men pushed a doomed man through a backyard fence and soon after, five shots rang out on a Sunday afternoon in Fort Lauderdale. But the assailants had overlooked one big factor in their plan — they were both wearing GPS ankle monitors, police say. The devices are used to keep track of people who are released from jail while on bond, before their trials happen. Ricardo Rodrigo Jr. and Arthur Washington III were being monitored by GPS on Feb. 17, linking them to where 22-year-old Widell Everett was shot to death, an arrest warrant said. Those four words, a plea, were perhaps his last. Rodrigo, 26, and Washington, 22, each is facing a charge of premeditated murder. Everett’s body and five bullet casings were found between the building where Rodrigo and Washington both live and the back of a nearby apartment building at 1019 NW Fifth Ave. There were two anonymous tips shared with police: One accused Rodrigo, by his nickname Rick, and Washington in the killing. A second caller pointed only to a “Rico,” and gave a physical description that matched Rodrigo, according to an arrest warrant. Detectives were investigating an unrelated homicide that happened the day after Everett’s killing. They found that the second victim, who was not named in the arrest warrant, had worn a GPS ankle bracelet at the time of his death. Investigators inquired then with the Broward Sheriff Office’s pretrial services department and the contractor that provides the GPS ankle monitoring system. Only two men, Rodrigo and Washington, were being monitored by GPS and were near the address where Everett was mortally wounded, the arrest warrant said. Rodrigo and Washington’s ankle-monitoring devices sent signals to “an average of nine satellites.” The contractor said based on that number of satellites, he “estimated the accuracy was very high” regarding the locations of Rodrigo and Washington during the time frame surrounding the homicide, the arrest report said. At 3:54 p.m., Rodrigo’s GPS signaled he was at the exact location where Everett was killed, between his and Washington’s apartment and the back of the apartment building at 1019 NW Fifth Ave.
At the same time, Washington’s ankle bracelet signaled he was in the backyard near the fence behind his and Rodrigo’s apartment building, the arrest report said. Two people in the neighborhood called 911, at 3:55 p.m. and 3:58 p.m., and told police they heard the gunfire and took a few minutes — one to secure property and arm himself and another to protect relatives — before calling. A third witness told police he saw Washington follow Rodrigo as he forced Everett through a hole in the fence that separates the apartment buildings. The neighborhood is east of Interstate 95, just north of West Sunrise Boulevard. A third man, who has multiple tattoos, may have watched the shooting and then walked away. Detectives have not verified that man’s identity or if he played any role in the homicide. He is not in custody, police said Friday, adding that they would not discuss the open investigation. Afterward, Washington’s GPS put him back at home for several hours. Rodrigo’s GPS and surveillance video tracked him traveling north to Cypress Creek Road and then south to Hallandale Beach. Surveillance video also showed him boarding a Broward County Transit bus at Northwest 38th Street and Powerline Road, the arrest warrant said. Ten days later, Widell Everett Sr. was at the Agape Funeral and Cremation Services in Fort Lauderdale, making arrangements for his son when Rodrigo rode up on an electric scooter. Rodrigo introduced himself as Rick and told the father he was sorry for his loss. Then Rodrigo showed the father texts with the nicknames of two men, and said they were responsible for the killing, the arrest warrant said. But Everett told Rodrigo he’d heard he was responsible for the death, which Rodrigo denied. It couldn’t have been him, Rodrigo said, because he’d been in Hallandale Beach at the time of the shooting, and showed the father his ankle monitor. Police were at the scene and crime tape was up when Rodrigo got home, he told Everett, according to the warrant. 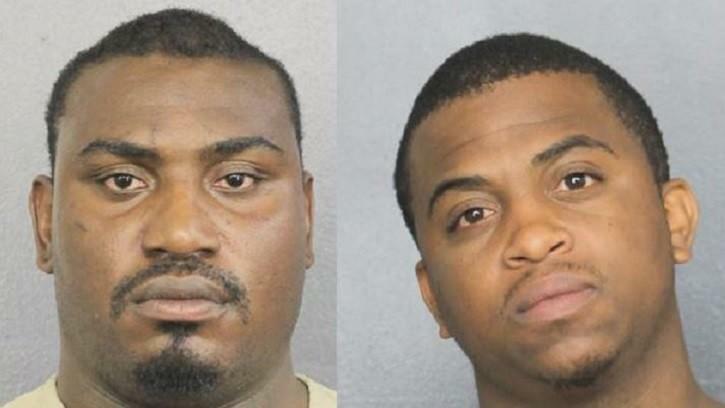 After their arrests Tuesday, Rodrigo and Washington were being held without bond in the main Broward County jail in Fort Lauderdale. At the time Rodrigo was taken into custody, he had open cases for felony theft and burglary offenses, and was on felony probation for drug and theft offenses and for resisting an officer with violence. Washington had open cases for grand theft, cocaine possession and burglary charges when he was arrested and was on felony probation for drug-related offenses, according to the arrest warrant.